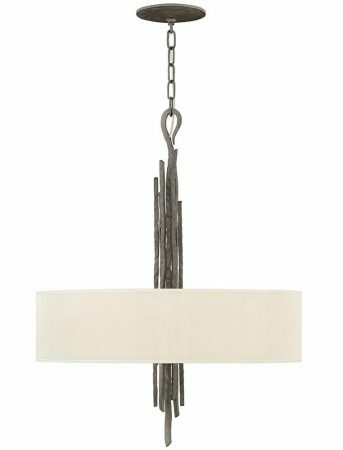 This Hinkley Spyre 6 light ceiling pendant in metallic matte bronze finish features a linen and organza fabric shade, contemporary design and artisan elegance. 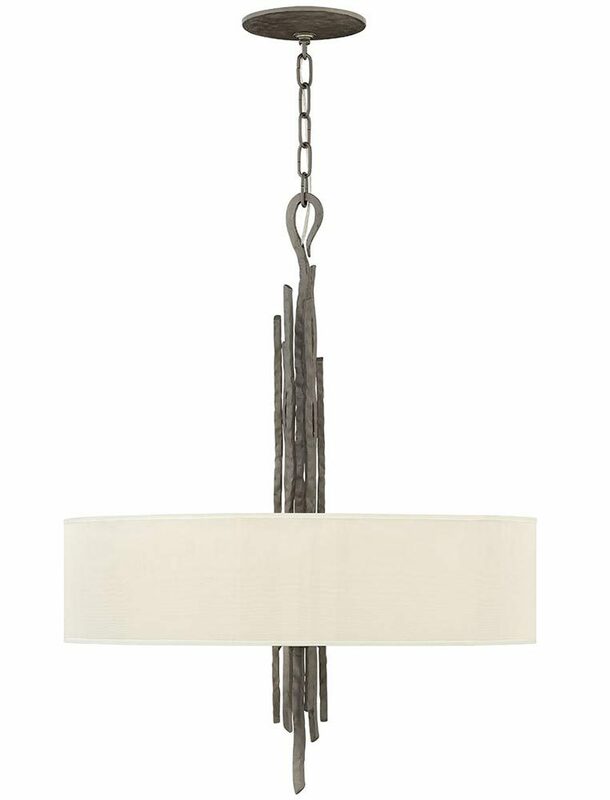 Boasting a hand-hammered frame, with top hook and central drop made from square section hammered steel. The six lamps are surrounded by a 61cm linen and organza fabric drum shade that softens the light beautifully. The Spyre pendant is a true statement-piece that offers captivating silhouettes with an organic edginess. The hand-hammered finish enthralls with artisan elegance and the contemporary look ensures that this stunning chandelier is suitable for a variety of interior styles. Perfect for a bedroom, dining room, hallway or living room with sufficient ceiling height. Supplied with 305cm of suspension that can be shortened at the time of installation to achieve the desired drop; please see below for dimensions. There are coordinated fittings available in the metallic matte bronze Hinkley Spyre collection that includes a six-light chandelier and 2 lamp wall light; please see below. Also available finished in champagne gold. This statement-piece ceiling light is supplied by Elstead Lighting and designed in the USA by Hinkley, founded in 1922 in Cleveland, Ohio. They have transformed from a small outdoor lantern company to a global brand intent on bringing you the best in style, quality and value designs like the Spyre 6 light ceiling pendant in metallic matte bronze finish featured here.